STRONGblog: Rational CLM 4.0 is released! So what does it do? As promised from the IBM Innovate conference last week, the Rational Solution for CLM 4.0 is now live. There are several new features to be aware of. First for larger deployments, RTC now supports clustering using WebSphere App Server Network Deployment. Note, that RTC does not include WAS ND, and you will have to buy a separate license for it. 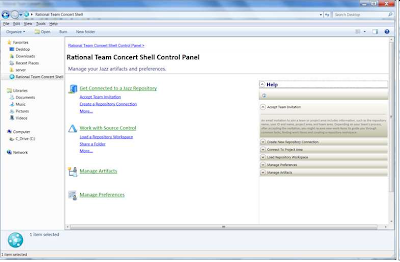 However, the CLM 2012 does include eXtreme scale Object Grid, which is used for the Jazz shared look-aside cache. Bottom line, you now have support for deployment management, session failover, and workload management. For those who have had issues with the fixed URL issue, the 4.0 version will not support renaming the server URL. This is critical in situations where you must separate the CCM, RM, and QM context roots onto new gear once you realize its getting more usage than you realized (a better best practice is to use 3 different host names for each application, but map them to the same IP at first; this makes it easier to split it later). Another common issue is the old mergers and acquisitions, where you have to change the domain name. Another gotcha that got resolved is being able to share a project's process template to another Jazz Team Server instance. Currently (in 3.0.x parlance) this can only happen on the same RTC/JTS repository. If you are doing Kanban, there is now a new Kanban taskboard to help you determine what resource capacity you have available, and if you are exceeding your target limits. For those poor souls doing waterfall (still) and working with MS Project (still), there are some new features to allow you to re-import tasks from Project into the project plan, and to export your RTC project status back into a clean MS Project file (however, the people who need to see that project plan, could see it even better using the RTC Dashboards ... just saying). In the area of access control, more granular features have been added to allow you to set access at the work item level. 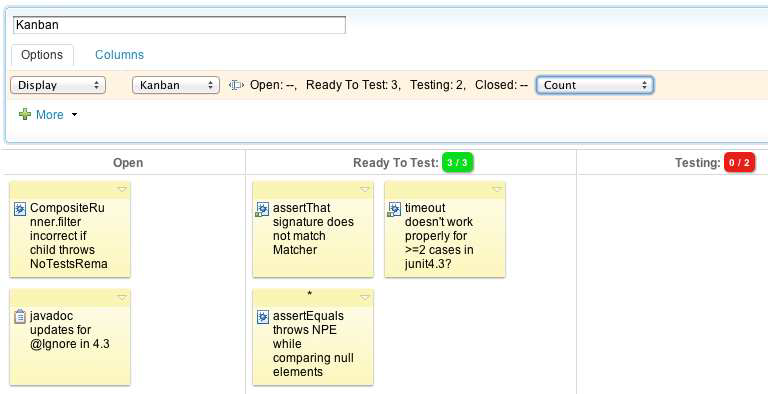 For example, you can allow 2 team areas to view a work item, and exclude all others. You can also apply read access control at the versioned artifact level in source code. This one was important for the systems engineering space in defense contracting. Work item queries can now have variables. 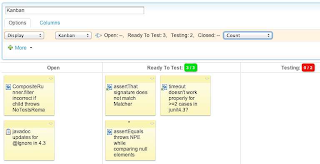 This allows a query to be specified differently with each execution, and therefor have to manage less queries in total. Work items can now refer to external data set providers. This allows you to set a a drop down value in a work item to a list of industry, company, or domain specific values that can change over time, rather than a fixed list of values. The external data provider must be a REST based provider. For SCM, in addition to the permissions listed earlier, an administrator can now permanently delete files (another issue with shops doing security level development). There is an enhanced locate change set editor to allow a developer to find where his/her change sets have flown to ( for shops doing multiple streams). A developer can also easily revert to any checked-in version from history (a feature that is a PITA now at 3.x level). Also, there are new load permissions that can be enabled to control how your files get loaded across streams and repositories. If you are a Hudson/Jenkins shop, RTC now supports these servers for build automation. 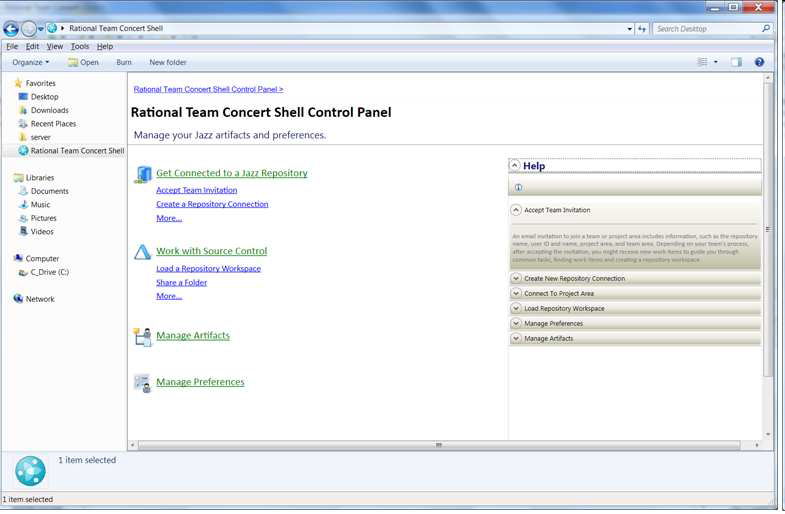 You can now view build health and control builds through the RTC interface (web, eclipse, VS). For command line junkies (like us), there is a new command line interface (CLI). Subversion people will find it much easier to migrate with this (https://jazz.net/wiki/bin/view/Main/SCMCommandLineScriptingSupport). Another rather fantastic new feature is the Windows Explorer integration. Now you can check and version directly from the Windows environment. This can be incredibly handy for sys admins who need to version scripts, or other developers to need simple versioning for binary files. This interface also supports locking of files.Files that have been versioned are decorated with status icons and have custom context menu options. Developers who have used TortoiseSVN will find this easy to adopt and very familiar. There are also new features for enterprise platform developers (System i/z), that we'll discuss in more depth later.